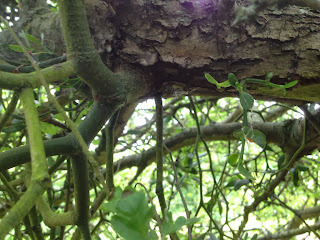 I sat for a while under a large pear tree, pulling weeds from under its canopy. 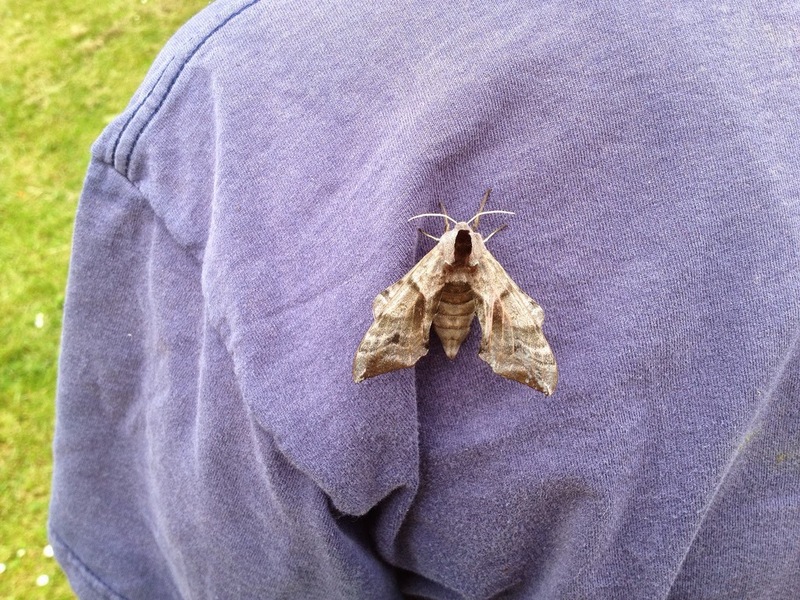 When I came out, my colleague went quiet and looked strange, his eyes on my back: "you have something on your back". A large moth was taking a ride. "A picture, take a picture...", says I, and a few people tagged along with their mobiles too. The moth did not seem inclined to leave me, so I carried on weeding, while it stood, parrot-like, on my shoulder. Luckily I'm not too fussed about this kind of things! 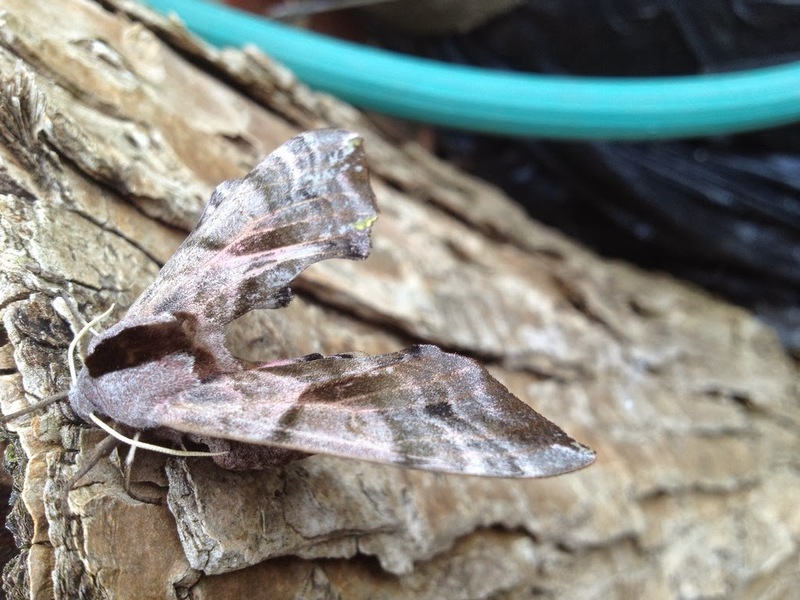 There it remained, until lunchtime, when we looked it up: eyed hawk-moth (Smerinthus ocellata) was its name. Not even the manager was immune from the fascination this large insect held on us. Unfortunately, in all the time it hung around, it never spread its wing so that we could see they eyes that give it its common name. Having left it on a log, I went back to my weeding. Another surprise was in store for me, inside a Crataegus. As I was trying to make my way under the specimen's canopy, in fact, our teamleader for the day asked me if I wanted to see something interesting. Well, you can guess my reply! 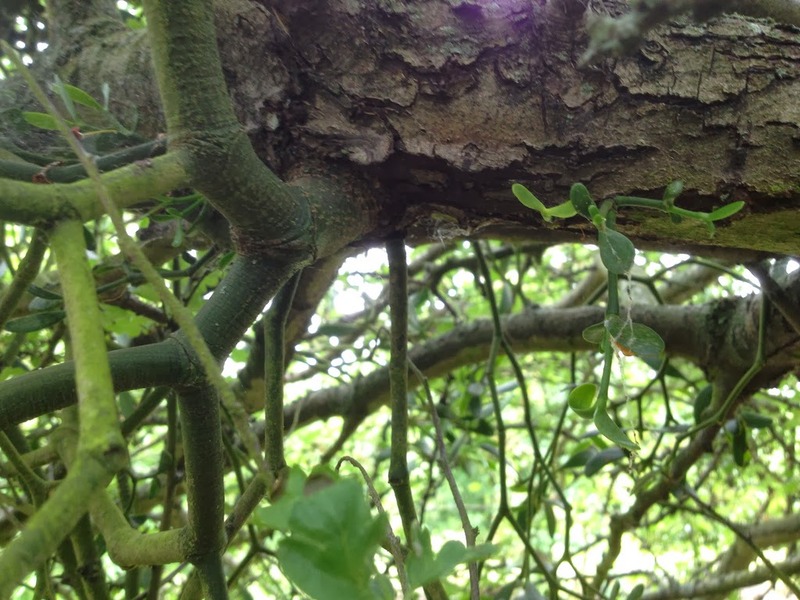 Deep inside the branches, impossible to see if not directed, was a mistletoe (Viscum album). Its main stem came out of an hawthorn's branch, almost indistinguishable from any other branch, it looked so at home there. A seedling emerged from the bark right next to it. An interesting team day, this one was, in my area!